Text & Photographs By Carol Afshar © All rights reserved. I love to be out and about in the early morning hours, camera in hand, photo jacket pockets filled with lenses and filters, tripod slung across my back. The anticipation of finding that special shot, capturing an unusual or beautiful picture, gives rise to excitement as I start out on my hike or "hunt" as a friend describes my photo shoots. But a few months ago disaster struck. I broke my foot! Weeks hobbled by – and one morning I awoke with a bad case of cabin fever. I needed to be outdoors! I absolutely had to get close to nature or risk turning more irritable and grouchy then I was already. But the important question was, where should I go? Someplace that didn't require a long hike or stealthy walking. (hard to sneak up on anything exciting with a clunky cast) I decided on the Ballona Creek Lagoon, located in Playa Del Rey, California. Luck was with me. The lagoon water was low with the outgoing tide. Surveying the site, the small pier jutting out into the lagoon looked inviting. I set up the tripod and was able to navigate around without causing too much noise. Egrets and gulls sat on the railings while others birds squabbled and fought in and around hiding places near the pilings. 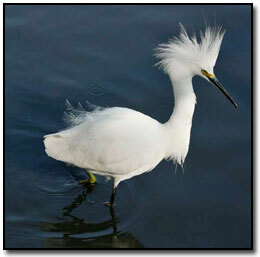 It was a feather-filled free for all as snowy egrets chased each other and fought over territorial rights and fish. At first my presence was an intrusion and many birds left the pier but soon greed overcame shyness and I was surrounded by feathers and mayhem. I spent the day shooting and laughing at comic bird antics, until poor light and gusty winds forced me to pack it in and I was able to cure my Cabin Fever – at least for a day!